Like so many of you, I love where I live. But every once in a while, I need to get away from the hectic mile-a-minute pace of the Lowcountry. To relieve the pressures of big city life, I recently embarked on a long summer road trip to seek out a quiet spot where I could reconnect with nature. And, of course, by reconnect with nature, I mean find out how much of nature I can kill and eat. This year’s reminder of my lofty height in the food chain brought me to rural Minnesota, where I figured with 10,000 lakes, at least one of them would have a fish dumb enough for me to catch. It turns out I was mostly misguided, as usual. I did manage to catch one fish over the course of four days, but not before demonstrating how completely incompetent I am as a fisherman. If you’ve ever watched infomercials for the Ronco pocket fisherman, I am the guy they film in black and white. It’s not that I fished for four days and only caught a single fish. It’s that I fished for four days while failing on every level as both a fisherman and a human being and only caught a single fish. The silver lining here, however, is that I can now turn my nincompoopery into a series of teaching moments to help make readers of this publication better fisherpersons. After several days of failing to catch anything (but the shirts of people behind me when I cast) with the standard hook, bait and bobber, it was my wife’s aunt who suggested I switch to a lure and maybe cast away from people. You know those dyed in the wool anglers? The type who can tie every knot known to man and can pull in a few pounds of fish with a string and a single Cheerio? The type who maintain an entire building separate from their home just for storage of their many fishing devices? That’s my wife’s aunt. Anyway, she handed me a Hula Popper, a lure roughly the size of Maroon 5 frontman Adam Levine, and told me to tie it onto the end of my line using a knot whose name eludes me but sounded highly technical. I’ve seen this knot done before, but my own version basically involved twisting the line around itself a bunch of times, weaving the end of it in and out of itself, sticking myself with a hook, cursing, trying again, getting a finger cramp, putting the whole thing down for a while, getting another beer, then finally just giving up and doing like six square knots in a row. I call it an Eh, Good Enough knot. Anyway, my Eh, Good Enough knot turned out to be exactly as reliable as its name suggests, and we all stood in awe as, on my first cast, I launched that hula popper in a graceful arc about halfway across the lake. It would have been a beautiful cast, if only my line were still attached to it when it landed. So yeah, get a grownup for the knots. At this point, my wife’s aunt suggested very directly that I take her paddle boat and go retrieve her lure from the middle of the lake where I’d flung it. I obliged, bringing along my pole under the misguided notion that I might have better luck catching a fish out in the middle of the lake. Because clearly the problem was water depth. I was about halfway out when I heard a commotion on the dock behind me. It turned out my son, who had never shown any interest in fishing but was suddenly proving to be annoyingly proficient with a fishing rod, had a bite. I should say, he had another bite as he’d already pulled in several sunfish. Furthermore, this bite turned out to be a two-pound northern pike that he was reeling in on his little sister’s toy Tinkerbell fishing pole, because regular poles were no longer challenging enough for him. Now this, my only son’s first pike, was a moment I knew I had to be a part of (if only to make snide comments about how cute and little it was, as is a father’s right when he’s being outfished). I snapped up the hula popper, hoisted it into the paddleboat, and reversed course. It was at that moment my fishing pole slid down into the passenger footwall of the paddleboat, where it was promptly snapped in half by the pedals. Not that it was doing me much good in one piece, but it was much easier to use in its unbroken condition. So yeah, always know where your fishing pole is. With what remained of my fishing pole, I made my way back to the dock. With all the professional knot tiers distracted by my son’s catch, it fell on me to hoist my ponderous bulk out of the paddleboat and tie it up (the boat, I mean, not my ponderous bulk). I think you can guess what happened next. I don’t tend to favor the Eh, Good Enough knot when tying up a boat. In this instance, I’ll usually go with the standard “wrap the rope around a nearby pole 2-3 times, then tuck a loop of it somewhere, then pull another loop through that one, then kind of gamely tug at it a little bit” knot. With the knots thus tugged for quality assurance purposes, I began the process of disembarking via getting as much of me on the dock as possible to reach equilibrium. That obviously failed, as there is quite a bit of me that needs to be on the dock for that to happen. My knots quickly undone by my plentitude, the paddleboat started drifting away from the dock. That it was carrying my legs with it quickly became a problem for the majority of me that was still clinging to the dock. With everyone on the far end of the dock, getting the net for my son’s prize catch, I bridged for what seemed like an eternity, stretched between an errant paddleboat and the dock. Somehow, I thought I might just have the core strength to pull that boat back, but it quickly became apparent that I did not. All of this—me flinging a lure into the middle of the lake, breaking my pole to retrieve it, missing my son’s prize catch and finally falling in—happened in the span of about 10 minutes, it’s worth noting. But in those 10 minutes, I learned a lot about fishing. 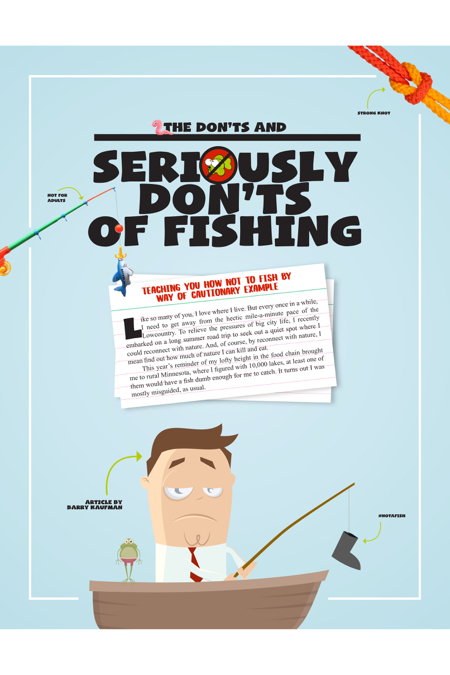 Specifically, I learned several very important lessons about how not to fish—lessons I used to finally catch a decent-sized bass and lessons I have now passed on to you. Now go out there and make your own mistakes. It’s how great fishermen are made. Or in my case, semi-competent fishermen.